It is an evidence to say that the countries of the South are materially and financially poorer than their colleagues of the North. To this material poverty is added for certain countries the strategic absence of a well thought cultural policy. On the operational plan we also notice, with the exception ofB some cultural centersB belonging to western countries (French Institute, Goethe Institut, etc.) the absence of spaces of creation and exhibition of cultural products belonging to the state and/or toB private national. Because of the narrow nature of the Market and the purchasing power of the populations who are for the greater part forced to take care ofB the most elementary needs for survival (accommodation, feed, to dress, etc. ), private promoters hesitate to invest in this sector which require big investments without guarantee of profitability. The private entrepreneurs hesitate especially as, in many of these countries, the state is totally absent and does not use tools such as the financial public subsidies, education or the media to assure the promotion of culture and arts. This situation of lack of spaces of creation and exhibitions of arts and culture and the generalized shortage confines artists and the creators of cultural products in an impoverishment so that the artist has to choose between resignation, amateurism, travel residences overseas or even exile. Mobility: a chance for the artists? The absence of appropriate and accessible spaces of creation urges numerous artists of the South to request residences of creation worldwide in particular in the North to find themselves inB ideal conditions of creation. The need for space technically well equipped for the creation of cultural products is not and should not be the only motivation of the artists. Creation residences also allow artists to have exchanges, experiences and intercultural dialogue with their host country. These journeys also allow them to reachB diversity and are very enriching for their creation and also for the exhibition and the marketing of their works. The possibility of opening, sharing, exchanges of intercultural experiences that mobility offers should be encouraged at first in the interest of the artists but also and especially in the interest of the world community which has to make everything to offerB visibility and chances of expressions to all the cultures of the world. However and it's a pity that this mobility so wished and which should be encouraged is hindered by numerous obstacles. Some artists hesitate to make the bet of mobility because of the barriers of language. How to live, to exchange, to interact and to work in a country of which we do not speak the language? How to survive months in a country when we are not sure to enjoy its cuisine. How to venture into another country, when we think of xenophobia and possible rejection? And if the journey revealed us how we are foreign to ourselves? Those apprehensions here are among others brakes to the mobility. But the biggest obstacle to the mobility is the dependence of the potential travelers on the granting of a visa. We are not free to come and to go, because of the border barriers between countries and inhabitants of the same planet. Visas are required to leave from a country to another. Generally it is easier to move when you travel from a country considered as "rich" to a "poor country". The travel in the opposite direction on the other hand is often an exploit.B The a priori of the boffence of povertyb and the suspicion that the so call bpoor peopleb who would reach the bparadiseb would not want to leave any more, are the major reasons for which visas are not granted.B More and more, we meet artists having obtained the binvaluableb visa but who give up the journey and the mobility which was considered at first as a beautiful opportunity because of the experience of the contempt and the feeling of condolence with which the visa is granted to them. By pride they say no to the condolence and choose to continue to cultivate the spirit where they are without living in insulation in any island, the global world offering now other possibilities of mobility. It's not any more an idea, a possibility, it is a fact. In Yaoundé in Cameroon the average citizen living in big cities receives more than 100 channels of televisions through the cable. Many artists could decide for example to make a work by being inspired by the sociopolitical, cultural and economic current events of another country or by any region. He could besides complete this information with the reading of newspapers on the Internet, discuss in the various forums with the citizens of these countries on the Topics which interest him. He can then choose on the current events of this country or this region the topic or the object of his work of artist. Artists have the possibility if they wish through the virtual mobility to go out of the blocalb and to address the bglobalb issues. More and more artists worldwide work on common projects during many months by exchanging via the Internet without having met ever or before they do it. These various experiences are enriching because they also allow through such initiatives to understand the angle of approach and the influence of background of the various artists on the returned work. More and more artist has websites which allow them to make their work known and to sell it better. A visual artist can make his works known and sell them better through a personal virtual gallery or that of an artistsb platform. A Comedian can broadcast the videos of his bone man showb on the social networks and on you Tube and sell them by download in digital medium on specialized websites. It has become possible today to reach diversity, to be able to exchange and to share the experiences and to use the possibilities of this virtual mobility to create and to spread cultural works. If the virtual mobility comes to open numerous perspectives to the artist, in particular an opening of access to the contents and to the market of the north, we should recognize thatB numeric fracture cannot allow an optimal exploitation of such an opportunity. So the countries of the South are lagging behind and this penalizes the development ofB arts and culture in these regions. Consequent investments in the field of information and communication technologies could allow the countries of the south to benefit from advantages that the virtual mobility offers in the cultural domain. Here also the surprising barriers between states of the south could be lifted by this new shape of mobility and allow more than in the past, artists of the same geographical region to be more easily in contact and to envisage common projects. It's clear and it is also necessary to say it here: virtual mobility and the possibilities that it offers should not be a reason to give up the physical mobility of artists who need to smell the odors, to touch things, to consider gestures during conversations etc. we also have to ask ourselves some questions about the capacity of this virtual mobility to helpB increase the demand of the market ofB cultural products in our countries. If our cultural markets cannot allowB artists to live on their art, the risk is big that they are forced to choose between amateurism andB exile, what would consolidate certain consulates in their position and in their role and would damage the mobility. If the economic development and its consequence, the purchasing power delay serving the market of art in the countries of the South, we shall without any doubt forced to think of another shape of mobility: that of the spirit. It will be a question of inverting the pyramid of Maslow to feed and cultivate at first the spirit before feeding the body. The artist could be for their own interest the precursors of one such paradigm. one paradigm which should meet a favorable echo within the opinion? Considering how harder it is, the equation to feed a growing population with limited materials resources. André, Kounchou FEZE: Studied Tourism management and Projects management in Germany and in France. 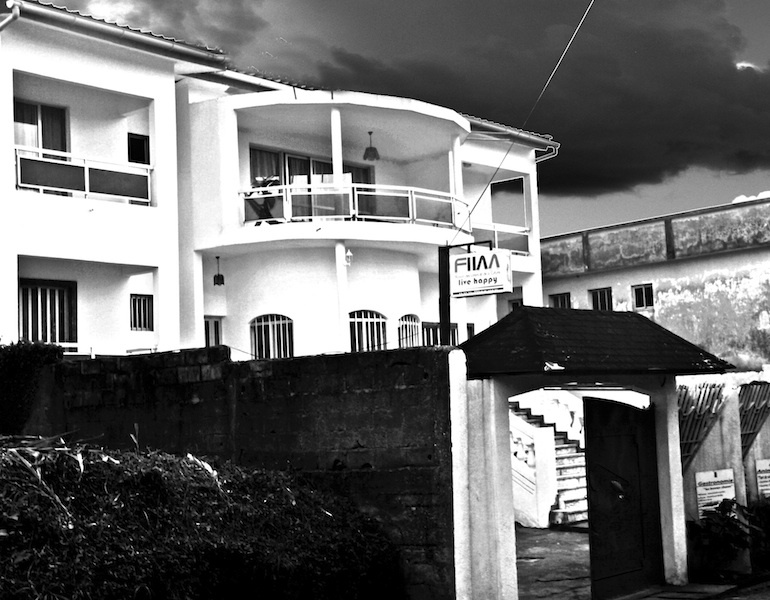 Fascinated by culture, he returned to his country Cameroon and works as coordinator of a Volunteers program for the German cooperation before creating FIIAA, a leisure and cultural House.